Russia, Vol. I and Vol. II and is a Contributing Editor of HNN. For a list of his recent books and online publications, click here. Most Americans know little about Russia and Russians except that they might have interfered in our 2016 elections. In a July 2018 poll, 85 percent of Democrats and 46 percent of Republicans thought they did interfere—and Putin is a “bad guy.” But how different are the Russians now than they were under communism? How do the Russian people feel about life in general? About President Putin and their politicians? About the USA and President Trump? In Nobel-Prize winner Svetlana Alexievich’s oral history Secondhand Time she writes about how Russians were unprepared for the freedom and openness (glasnost) that Mikhail Gorbachev introduced inthe late 1980s. Many of them “were so terribly eager for the gray Soviet everyday to turn into a scene from an American movie!” They had “new dreams: building a house, buying a decent car.” But “freedom turned out to mean the rehabilitation of bourgeois existence, which has traditionally been suppressed in Russia. The freedom of Her Highness Consumption.” Everything around them had “been transformed: the billboards, the clothing, the money, the flag… And the people themselves.” As one of Alexievich’s interviewees complains, “a cult of money and success” had become the new idol. During the twenty-first century, when Vladimir Putin has dominated Russian politics as president for 14 years and prime minister for four (2008-2012), Russia has been more stable and powerful. Consequently, his approval ratings have been much higher than were those of Gorbachev and Yeltsin. In percentage terms, they have fluctuated between the low sixties and mid eighties, and he still has five more years to serve as president. Under him the economy has improved, as has Russia’s international influence. People believe they are better off than in the late 1980s and 1990s. Nevertheless, after being elected to a fourth presidential term by 76.69 percent of the vote in March 2018, Putin’s popularity has sharply declined. Until last year, Russia’s increased political and economic stability and increased nationalistic success strengthened Putin's approval ratings and powers. He began his presidency in 2000 by blaming mysterious apartment bombings on Chechen terrorists. Then, in his determination to prevent its secession, he launched a major attack on Chechnya. By early 2003 he had established a Russian-backed Chechen administration and gotten voters to approve a referendum that included a provision that Chechnya would remain an “integral and inseparable” part of Russia. A successful 2008 Russo-Georgian War preventing Georgia (formerly part of the USSR) from regaining control over the two breakaway provinces of South Ossetia and Abkhazia also strengthened Putin, as in 2014 did the Russian annexation of Crimea (earlier part of Ukraine). In a 2015 essay, (“Is Vladimir Putin an Ideologue, Idealist, or Opportunist?”), I indicated that since coming to power Putin has consistently stressed statism—subordinating individuals to state interests. He has also emphasized traditional Russian values and strengthening Russia’s international power and status, including among other former parts of the Soviet Union. Hisuse of force in the areas mentioned in the paragraph above is in keeping with these aims. So too is his more recent military support of the Syrian government of Bashar al-Assad and his continuing (deleted word) covert aid to separatists in eastern Ukraine. As long as economic conditions remained generally positive, most Russians approved this approach. 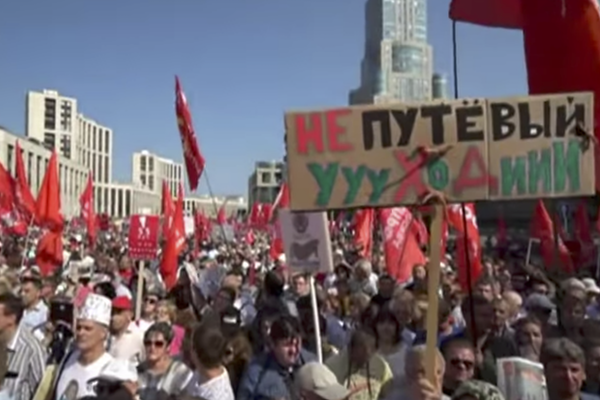 Despite sporadic individual and mass protests against his rule, Putin’s media controls and his gradually strengthened powers over other branches of government also minimized political opposition to him. Soon after the 2018 March election, however, the government announced plans for a pension reform. This has been the main reason for the recent decline of Putin’s popularity. The reform proposed a gradual rise in retirement age, from 60 to 65 for men and from 55 to 63 for women. In the face of massive protests and overwhelming opposition to the change, Putin reduced the new age for women to retire to 60, but still signed the unpopular bill into law in early October. By December a poll by the respected Levada-Center indicated that only 66 percent of the Russian people approved of Putin’s presidential actions, as opposed to 80 percent in January. That same poll indicated that toward the end of each of the previous four years, his rating had ranged from 85 to 82 percent approval. In those same four years, which followed the annexation of Crimea, there had been a gradual decline in people’s purchasing power, largely due to declining world oil prices and Western sanctions. The new pension changes, however, shocked many Russians into realizing that Putin’s diplomatic and military gains did not make up for their increasing anxieties about fulfilling their own dreams for a better material existence. Putin’s declining popularity since March 2018 has also shown up in other ways. By the end of 2018, Russians were less likely to accept the regime’s anti-Western propaganda, but more likely to favor protests and believe that Putin sided with special interests rather than standing up for the average citizen. Of course, opposition to Putin should not be exaggerated. Two-thirds of the population still approved of him, even more among the elderly and those living outside Moscow and St. Petersburg. Although attitudes toward the United States have improved somewhat as Putin’s popularity has declined, Russians have also become more critical of President Trump, who in October 2016 was preferred over Hillary Clinton by an almost five to one margin. What all of the above information about the Russian people tells us—in the words of one Russian scholar—is that there is “no great chasm between East and West. . . . Russians share the same daily concerns about standards of living and their children’s futures as do most people the world over . . . . Russians are no more nationalist—perhaps even a little less so—than inhabitants of the United States and United Kingdom.” In their primary concern with increasing the financial and social well-being of themselves and their families, they are pretty similar to U.S. citizens. In that older Russians and those living outside large metropolitan areas are more conservative than those in the biggest cities, they are also like our citizens. Of course, important differences remain. To name just two: our media is much freer than Russia's and its political culture and traditions are much more authoritarian than ours. But, as two American poets a half-century or more ago, realized—despite Soviet communism—Americans and Russians had much in common. In 1959, poet Carl Sandburg accompanied a traveling exhibit to Moscow. The pictures in the exhibit were gathered from almost seventy countries and were meant to demonstrate humanity’s oneness. In the Prologue for the extremely popular book, The Family of Man, which reproduced the photographs, Sandburg wrote: “Everywhere is love and love-making, weddings and babies from generation to generation keeping the family of Man alive and continuing. . . . Alike and ever alike we are on all continents in the need of love, food, clothing, work, speech, worship, sleep, games, dancing, fun.” About a decade later poet Wendell Berry penned “To a Siberian Woodsman,” in which he expressed similar sentiments. The writings of Sandburg and Berry display wisdom, compassion, and imagination. Both of their writings reflect their ability to look beyond media noise and penetrate to the core of life, to the things that really matter. To understand the Russian people, we need such skills today.